Royal City Musical Theatre presents Singin’ in the Rain at the Massey Theatre in New Westminster April 4-20. For those unfamiliar with the story, Don Lockwood and Lina Lamont are silent film stars, dashing and beautiful, but their stars will fade unless they can make the transition to talkies, the new technology of the time. 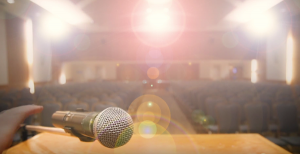 The studio decides to change the couple’s latest silent film into a musical but, the problem is, Lamont has a horrible voice – even listening to her talk is painful. The solution? Have her voice dubbed by aspiring actress Kathy Selden. Filled with humour, eminently singable and memorable music – “Good Mornin’,” “Make ’em Laugh,” and, of course, “Singin’ in the Rain,” to name a few – and incredible choreography, Singin’ in the Rain is one of the most popular musicals of all time, while also being an insightful commentary on the film industry, the impacts of technology and the nature of fame. Cohen said he was asked to audition for the role of Lockwood last fall, while he was away doing Fiddler on the Roof in Saskatchewan. And Cohen has more than the chops necessary to step into Kelly’s shoes. Since the Jewish Independent featured Cohen and his wife, Anna Kuman, in 2017, when they premièred Circle Game: Reimagining the Music of Joni Mitchell – which they co-created and co-directed – the couple has been working on different projects around the world. 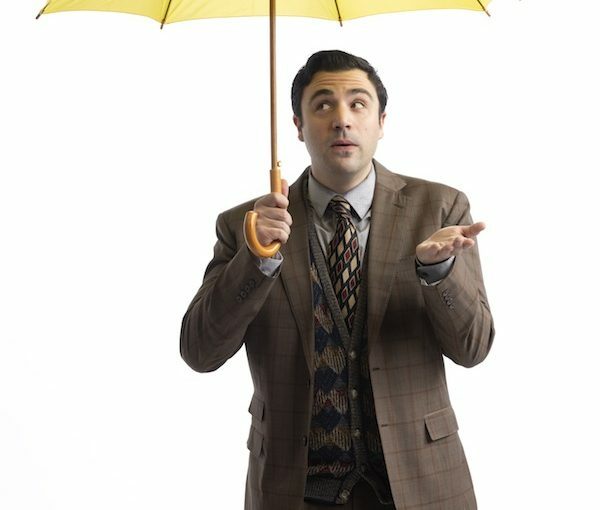 Singin’ in the Rain marks Cohen’s debut with Royal City Musical Theatre. Cohen’s fellow Jewish community member, Wilkinson, certainly enjoys this annual tradition. Wilkinson is in his final year of studies at the University of British Columbia’s Institute for Gender, Race, Sexuality and Social Justice, so he’s not sure how long he’ll be able to continue performing with RCMT, but he feels “very fortunate to have been a part of five productions over the last few years.” As part of the ensemble in Singin’ in the Rain, he has more than one role. For tickets to RCMT’s Singin’ in the Rain, visit ticketsnw.ca or call 604-521-5050. It was hard not to sing along. In fact, the couple in the row behind me couldn’t stop themselves on more than one occasion. So wonderfully witty and familiar are all of the songs in My Fair Lady, which is playing at Massey Theatre until April 26. Directed by Max Reimer, the Royal City Musical Theatre production is well worth the trip to New Westminster. If you’re like me, the proposition is daunting. I made an afternoon and evening of it, heading out from Vancouver before rush hour, enjoying a walk along the quay and dinner with friends before heading to the theatre for the 7:30 p.m. show. While it took almost an hour to get to New West, I made it back in about 25 minutes. Granted, that’s about 15 minutes longer than if I had been coming from downtown, but the parking was plentiful and free – and I had longer to sing in the car on the way home, which made the drive seem that must faster. I had forgotten just how funny are the book and lyrics by Alan Jay Lerner – even 50ish years after they premièred on Broadway! With the stellar cast enunciating brilliantly, nary a word was lost, and the 22-piece live orchestra and 30-plus cast also gave justice to Frederick Loewe’s music. Led by Warren Kimmel as Prof. Higgins and Tracy Neff as Eliza, there are many standouts in the Royal City production, including John Payne as the charming scoundrel Alfred P. Doolittle, Eliza’s father, and tenor Thomas Lamont as Freddy Eynsford-Hill, who falls for Eliza at the Ascot (her test run as a lady) when she cheers on the horse Dover to win, hollering, “Come on, Dover! Move your bloomin’ arse!” In addition to Kimmel, other Jewish community members involved in the show are Jonathan Boudin and Kathryn Palmer in the ensemble. Both do very well, but Palmer is particularly expressive, standing out as both a flower seller and a maid, very much at ease on stage. The entire cast seemed to be having a great time on the preview night I attended, good-humoredly negotiating through a couple of technical glitches, including a tough-to-light candle. And the main two sets, which go from being two sides of a London street corner to Higgins’ study when they are turned around and pushed together, are fabulously detailed and necessarily sturdy (the actors must travel to a balcony on one side, a landing on the other), but they must be quite heavy – every time the halves of it slowly came together to form the study, I released a small sigh of relief. For tickets ($26-$47) to My Fair Lady at Massey Theatre through April 26, visit masseytheatre.com or call 604-521-5050.